2K and Irrational Games have released Burial at Sea- Episode 1 for download worldwide on 360, PS3, PC and Mac. The DLC is the second add-on pack for BioShock Infinite and returns players to Rapture. The episode is priced at $14.99 or as part of the BioShock Infinite Season Pass that costs $19.99. Irrational Games is already working on the second episode of Burial at Sea, but a release date has not been mentioned at this time. New York, NY – November 12, 2013 – 2K and Irrational Games announced today that BioShock® Infinite: Burial at Sea – Episode 1 is available for download worldwide* on the PlayStation®3 computer entertainment system, Xbox 360 games and entertainment system from Microsoft and Windows PC starting today. 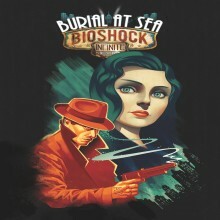 BioShock Infinite: Burial at Sea – Episode 1, developed by Irrational Games, is the second add-on content pack for the award-winning BioShock Infinite, and features Booker and Elizabeth in a film noir-style story that places them in a shining Rapture on the eve of its fall from grace. BioShock Infinite: Burial at Sea – Episode 1 can be purchased separately for $14.99, or as part of the BioShock Infinite Season Pass, which is priced at $19.99. The Season Pass, which is available for purchase via online marketplaces on all available platforms starting today, contains $35 of playable content for $19.99, including both Burial at Sea episodes, the previously released Clash in the Clouds add-on pack, as well as the Early Bird Special Pack that has powerful weapon upgrades, exclusive gold weapon skins and infusion bottles to upgrade player abilities. BioShock Infinite: Burial at Sea – Episode 2 is in development at Irrational Games and brings gamers something they have been asking for since they first met the character of Elizabeth: the chance to see the world through her eyes and face challenges as she would. In this second episode of Burial at Sea, players will experience a new storyline, and a new stealth-oriented gameplay experience. BioShock Infinite is rated M for Mature by the ESRB and is available now for the PS3™ system, Xbox 360, Mac® and Windows PC. For the latest news and information on BioShock Infinite, become a fan on Facebook and follow Irrational Games on Twitter.